I am the perfect audience for The Muppets. A middle-aged guy who has never been a fanatic about the Muppets, but who has frequently watched the show as a child, often enjoying it, sometimes being a bit bored by the celebrity hosts (or most of the times not even knowing these American old people), and who has lived a life with frequently recurring Muppet references. They are a cultural phenomenon today more than they are a tv show, after all. Miss Piggy may be the most well-known star of her generation, Kermit the Frog certainly outshines any other tv show host in terms of popularity and green-ness. If you were a devout Muppets fan, “The Muppets” might let you down a bit … many of the beloved show elements are missing (no cooking with chef, no scientific experiments with the lab professor and Mimimi – even though both they all are in the film and contribute their share), the voices are different from the original voice cast (Henson died, Oz not involved here), the plot slumps a bit in the middle, and even the announcement of a montage does not save the film’s middle part from slightly dragging along. In short: hardly ever has an icon of entertainment been treated so well so long after its heydays were over. Well done! I really enjoyed this film. They struck the perfect balance between welcoming new fans (children) and giving a nod to older fans (me). That man or muppet song was great. I hope it wins best song tonight. 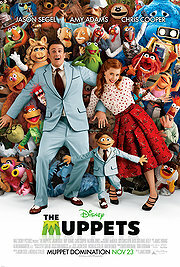 Did you hear about that fox news report and their anti-muppet rant viewing this film as an attack on the oil industry?